Slovenia, a small but beautiful country, has a great deal to offer. Every season of the year offers up new and different opportunities. In the summer outdoor activities are endless from gentle walks to climbing Mt Triglav, Slovenia’s highest and the emblem of its national flag. In winter it is the same. You can ski, both Alpine and Cross Country, snow shoe, ski tour, ice skate and you can try Ice Climbing. What makes Ice Climbing even more spectacular is that you can try this as a complete beginner under a night sky, the route illuminated by floodlights from the base and, if you are lucky, the moon overhead. Using ice axes and crampons, the 30 metre high frozen waterfall of the Mlačca Gorge, just south of the alpine village of Mojstrana, is one such place where ice climbing is popular under the expert instruction of Gregor Kofler, founder with his wife Anita, of adventure sports company Kofler Sport. On my last visit to Slovenia in January 2019 I decided to give it a go. Of the choices of route up the ice wall, Gregor guided me towards the left side for my ascent, this side being what he described as the easy route. Over on the right side there are additional routes, more technical and steeper, for experienced ice climbers. All I can say about the easy route is “Not so easy”! There is something about clinging to the side of an icicle with your toes straining to gain purchase and your forearms quivering as you hang from a pair ice axes that gets your attention. However, I felt completely safe knowing that Anita was anchoring me as I ascended and this allowed me to concentrate on the techniques Gregor had shown me. 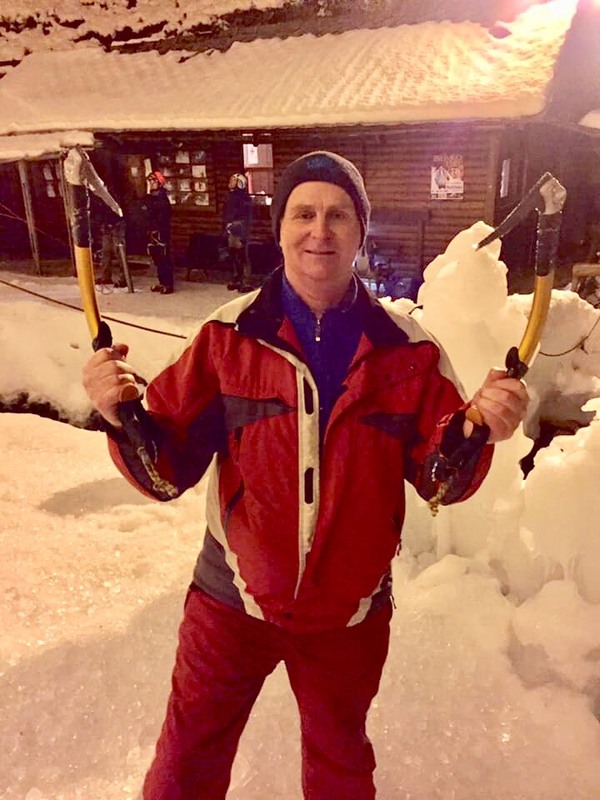 Three points of contact at all times, a sharp snappy swing of my right then left ice axe above my head into the ice wall and a push up from my foot hold saw me gain altitude at a surprisingly fast rate. The adrenaline was certainly flowing and I was enjoying my environment. In some ways it provided an insight as to why mountaineers push the limits to reach the highest altitudes and most inhospitable places on earth. Another Slovenian adventure completed and one that I may well to choose to go back for more. Maybe next time I will look at the right side of the ice wall. 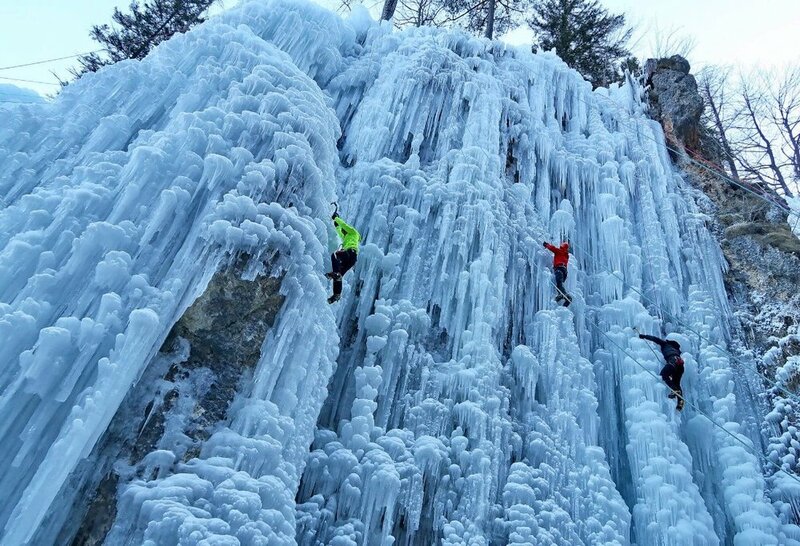 If you want to have a go at Ice Climbing in Slovenia contact Gregor and Anita Kofler. All details of this and other winter adventures can be found on their website www.kofler-sport.si. You won’t regret it. This memory belongs to our Passenger Peter Hayes (@hayes1955) . All the pictures belong to Peter’s personal archive. To know more about our Passenger, click here.